Watch this video from Gale Brewer’s Aging Artfully event on August 8! Next Avenue Article about The 7 Benefits of Dancing at Any Age! Check out this great article from Next Avenue about The 7 Benefits of Dancing at Any Age! 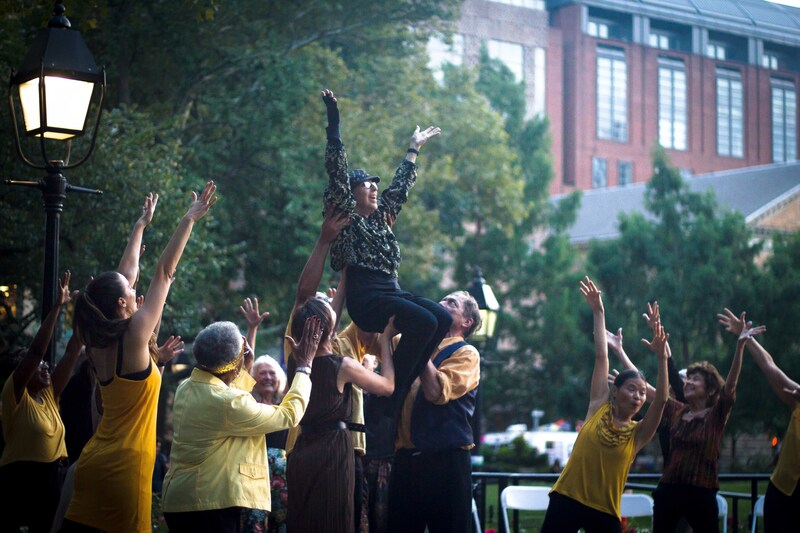 On September 15, 2018, Dances For A Variable Population will present Washington Square Dances 2018 at 6pm at Garibaldi Plaza, Washington Square Park. 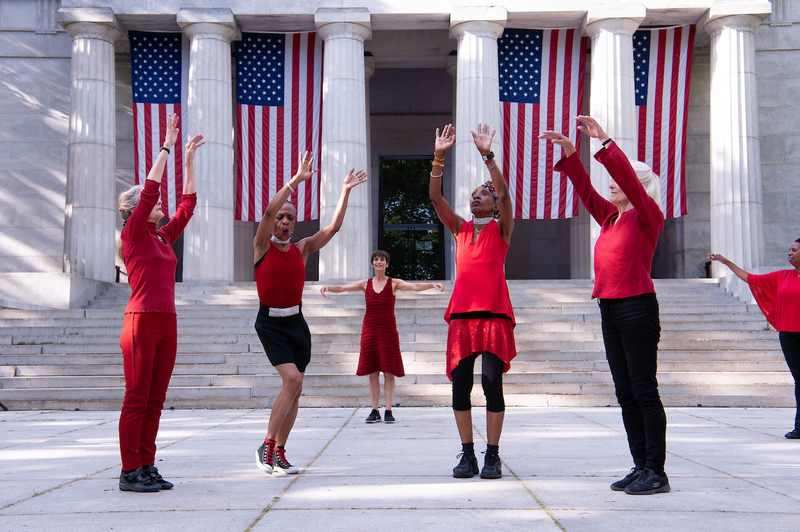 Featuring the beauty of age and using the power of dance to create community, Dances For A Variable Population (DVP) will present one performance of Washington Square Dances 2018 at Garibaldi Plaza, Washington Square Park on Saturday, Sept 15 at 6:00pm. This performance will highlight DVP’s mission to promote strong and creative movement among adults of all ages and abilities, and will feature DVP’s multigenerational company, legendary guest artists and neighborhood seniors from our free programs at Washington Square Park. Choreography will be by DVP’s founder and Artistic Director Naomi Goldberg Haas and guest artists; Ellen Graff and Marnie Thomas Wood (Martha Graham Company), Elizabeth Keen (Paul Taylor Dance Company, Helen Tamiris/Daniel Nagrin), Audrey Madison (Charles Moore Dance Theater), Shirley Black Brown Coward (Audelco Award, Black Nativity), Myna Majors (Baba Olatunji Drum and Dancers), and Alice Teirstein (award-winning Young Dancemakers Company) and Margaret Yuen/Red Silk Dancers. This performance is free and open to the public. Support for Washington Square Dances is from the NYU Community Fund, the Washington Square Park Conservancy, the NYC Department of Cultural Affairs, the Mertz Gilmore Foundation and Manhattan Borough President Gale Brewer. The program is a joyous celebration of movement and dance- part performance by the multi-generational ensemble (ages 25 to 65) part interactive workshop for fun and friendship. Seniors should wear comfortable clothing. All Fun. All WELCOME! Watch this news clip from Japan’s NHK station on LES Parade! Heather Watts at George Bruce Library! Former NYCB principal Heather Watts led a guest artist session at the George Bruce Library MOVEMENT SPEAKS morning class. Take a look at the video from the event! Over the last few years, Heather has been sharing her expertise leading sessions about her personal experiences with master choreographer George Balanchine and his ballets. She was a fellow at the Center for Ballet and the Arts at NYU and has also led workshops at major universities and arts education programs across the country. It was an honor to have her expertise as we embark on REVIVAL 2, exploring the essence of great 20th Century dance. Former NYCB principal dancer Heather Watts to guest teach! On Friday, January 26, former NYCB principal Heather Watts will lead a guest artist session at the George Bruce Library MOVEMENT SPEAKS morning class teaching older adults in the West Harlem neighborhood. Over the last few years, Heather has been sharing her expertise leading sessions about her personal experiences with master choreographer George Balanchine and his ballets. She was a fellow at the Center for Ballet and the Arts at NYU and has also lead workshops at major universities and arts education programs across the country. DVP is honored to have her expertise as we embark on REVIVAL 2, exploring the essence of great 20th Century dance. REVIVAL is a celebration and renewal of great 20th Century modern dance, developed with the legendary dancers who helped create it and interpreted and performed by those artists and groups of non-professional senior dancers. Free public performances will take place on June 17 (Grant’s Tomb, West Harlem) and June 24 (Prospect Park, Bklyn), 2017 at 6pm. If you are interested in working with one of the artists listed below, please review the dates/locations, come to rehearsals and talk to the artists. ARTIST BIOS HERE! For more information, contact Naomi Goldberg Haas at 347-683-2691 or naomi@dvpnyc.org. 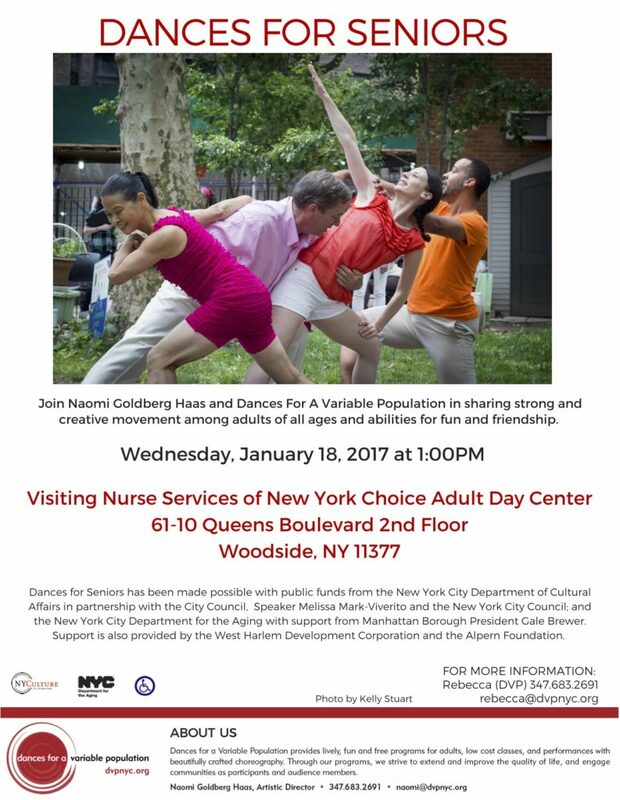 Join DVP this month for two Dances For Seniors events on January 18 and 23! Free and open to all. Tuition based classes are starting the week of January 9. Free MOVEMENT SPEAKS programs are starting the week of January 16. Please check the calendar for more information!